Chilean businessman Orlando Onetto (Francisco Reyes, left) shares an intimate romantic moment with his partner, Marina (Daniela Vega, right), in director Sebastián Lelio’s compelling new drama, “A Fantastic Woman” (“Una mujer fantástica”). Photo by Michelle Bossy, courtesy of Sony Pictures Classics. Aspiring vocalist Marina Vidal (Daniela Vega) must confront herself and her own identity under trying circumstances in the new Oscar-nominated drama, “A Fantastic Woman” (“Una mujer fantástica”). Photo courtesy of Sony Pictures Classics. 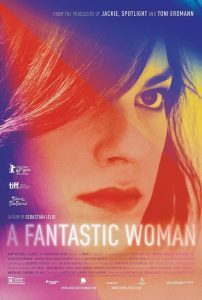 Chilean businessman Orlando Onetto (Francisco Reyes) leads a relatively pampered life, despite past troubles, in the engaging new romantic drama, “A Fantastic Woman” (“Una mujer fantástica”). Photo by Michelle Bossy, courtesy of Sony Pictures Classics. Launching a successful musical career is one of many challenges faced by Marina Vidal (Daniela Vega) in the new, Oscar-nominated drama, “A Fantastic Woman” (“Una mujer fantástica”). Photo by Michelle Bossy, courtesy of Sony Pictures Classics.